4:00 am…on a Saturday…and my alarm clock is ringing in my ear. We crawled out of bed, showered, loaded our packs in the car, and headed down the highway at 5:15 am. Call me crazy, but sometimes early morning wake ups make for the best days. Heading West to our destination, we timed it right and missed the weekend mountain traffic arriving to a mostly empty parking area. The air was a brisk 42 degrees and windy at 11,000 feet which made Bandit all the more frisky as he jumped from the Outback. It has been too long since we have taken a family hike together, so we were happy to breathe in the clean mountain air. 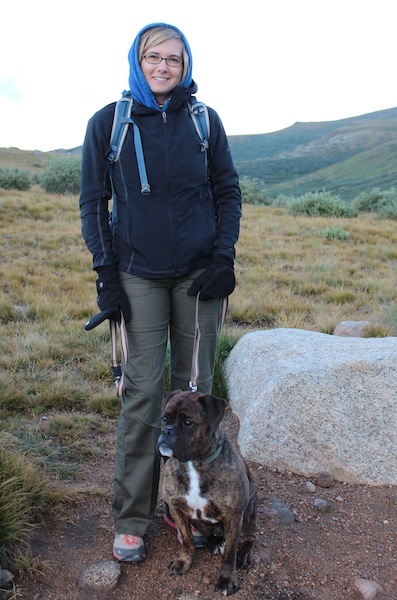 We picked a shorter trail with good scenery that was friendly for dogs (with a titanium leg). 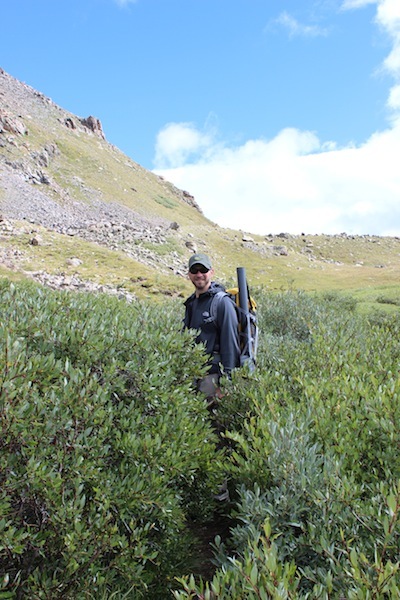 The hike ended at an alpine lake, so Josh brought along his fly rod to try his luck. The chosen trail (undisclosed) turned out to be a perfect choice. 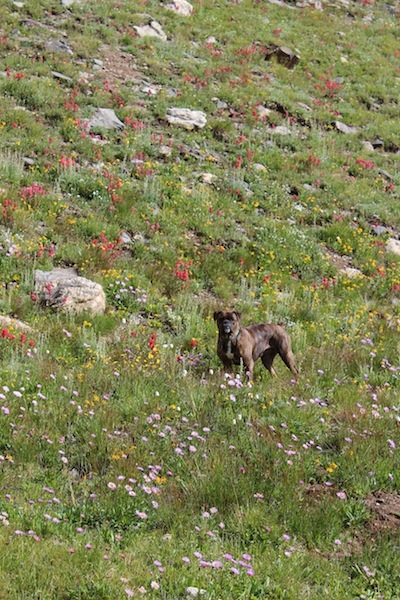 It was 4.2 miles out and back and surprisingly, many wildflowers still remained this late in the season. 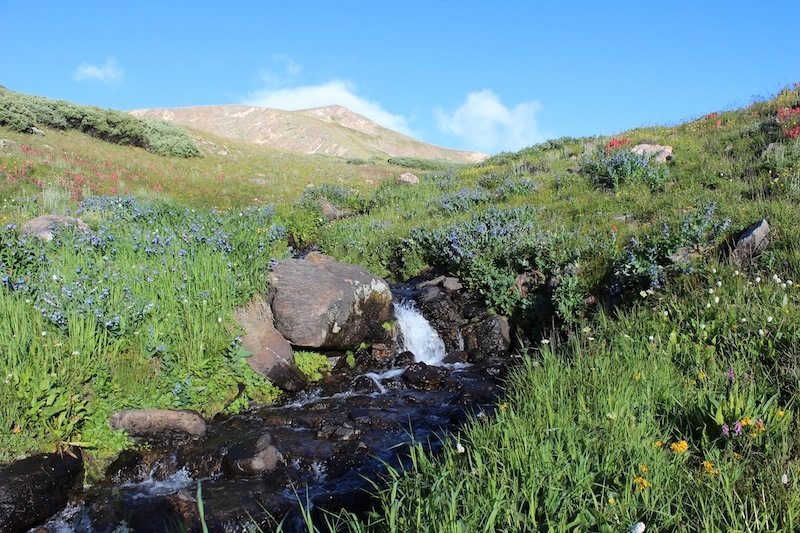 As we hiked up the trail, we encountered a few small stream crossings, waded through patches of willow thickets, and spotted six mule deer on a northwest hillside. Reaching the top of the ridge, the wind was fierce and almost unbearable. We pushed through to reach the next part of the trail where the mountains provided a barrier from the brutal gusts. 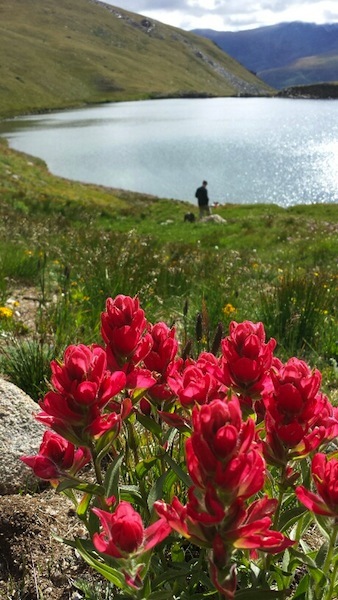 Red paintbrush, mountain gentian and tall fringed bluebells enveloped both sides of the path, which became marshy in spots as we reached our glacial lake destination. The alpine lake was peaceful, calm, and surrounded by mountains and wildflowers. After enjoying a well earned trail snack of cheese and jerky, Josh fished for a while, while Bandit and I enjoyed the views. We took our time exploring the area and made a loop around the lake. With clouds steadily rolling in, we decided it was time to depart and we began our decent. Bandit met a few doggie friends on the way down, and then started losing his energetic enthusiasm as we crept closer to our four mile completion. Hiking and mountain air always leaves us famished, so we decided to stop in Georgetown for a quick lunch. Yelp assisted us in our choice of Lucha Cantina. Lucha is located on 6th Street in Georgetown’s National Historic Landmark District. The menu is quite varied and they use all fresh ingredients; I ordered enchiladas, while Josh picked out one of the mac & cheese combos. The food and atmosphere was a great ending to our morning adventure and reenergized us for the drive back home. In celebration of a couple of spring birthdays, we wanted to go somewhere unique for a birthday dinner. Since moving to Colorado, The Fort has been on our “to do” list, so a birthday celebration was a great reason to visit. The Fort, located in Morrison, has been open since 1963 and was contructed as a replica of Bent’s Fort, a Colorado fur trade fort built in 1833. The Fort restaurant is an actual adobe fort built among the Colorado red rocks. To make The Fort experience even more authentic, the menu is designed around food eaten by pioneers traveling the Sante Fe trail, Native American cuisines, and meals served to traders at Bent’s Fort. Their specialties include elk, quail, and of course buffalo. 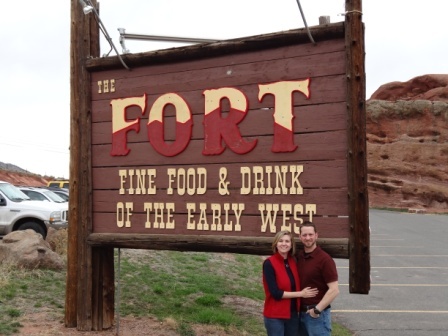 Our first visit to The Fort went beyond our expectations….great food, excellent service, and an Old West atmosphere. If you can’t make it to The Fort soon, then look here for their famous recipes! Our usual Friday night out typically involves a cold beer and burrito at a crowded restaurant just around the corner. But this night we decided to live it up a little since we had family in town. 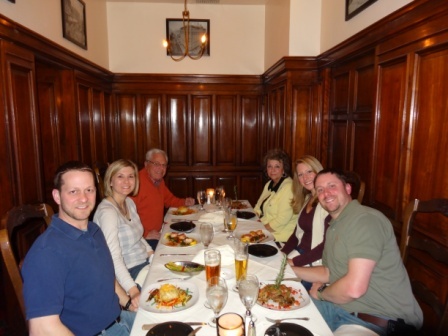 We had the pleasure of enjoying a delicious dinner at The Broker Restaurant in Denver. From the bottomless peel and eat shrimp…to the finale of dessert and coffee, The Broker did not disappoint. The Broker Restaurant provided us with more than a great meal, it was an experience. Opened in 1972, The Broker is located on 17th Street within the Colorado Yule marble walls of the old Denver National Bank. Seventeenth Street was once considered the center of the Denver business area. This fine dining locale retains a unique atmosphere as guests enter the dining room through the century old vault entrance. Only at The Broker can you dine within the private cherry wood walls that were once safe deposit box viewing rooms for wealthy bank customers. As we were seated, the wait staff arranged our table and placed napkins in our laps to prepare us for the forthcoming bottomless bowls of shrimp; warm rolls; and soup and salad – which threaten to shrink your appetite before the entrée arrives. I ordered bacon wrapped scallops atop a potato cake and spinach, which was beautiful to look at and tasted even better. J opted for the Southwestern Beef Wellington since he likes food with a spicy kick. Fine dining comes with a higher price tag, but The Broker is a must for a special occasion. A definite JKB Recommendation — Everyone living in or just passing through Denver should check out the historic attraction of The Broker Restaurant. We took a step back in time in this week to visit Denver’s oldest restaurant/steakhouse, The Buckhorn Exchange. Serving Beef, Buffalo, Elk, Duck, Lamb and more; this establishment is a carnivore’s paradise. This historic restaurant has been open for over a century, opening its doors in 1893. They have Colorado’s very first liquor license which was issued in 1935. This National Historic Landmark has not changed much over the years, and that is a good thing. Greeted by the eyes of over 500 prize game animals and seated at the red gingham covered table, it feels like you have entered into the wild west. 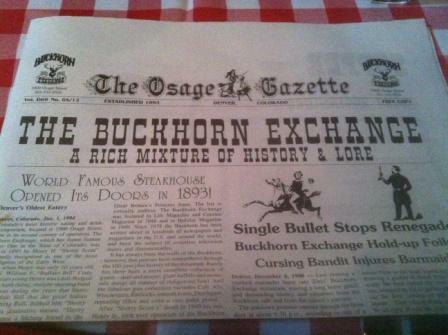 Dinner menus are presented as a nostalgic newspaper – The Osage Gazette. There are plenty of entrees to choose from but if you are really hungry, you might want to try The Big Steak. Steak sizes range from 1.5 to 4 pounds and can be shared with up to 5 people. That’s a lot of beef. Take a peek at the Supper Menu. J ordered the special for the evening – a combo plate of Buffalo and Elk. And I chose the Beef Tenderloin and Quail, along with a bowl of Buffalo vegetable stew. As expected, the meat is tender, seasoned perfectly and expertly cooked. With over 100 years experience, I wouldn’t have expected anything less. 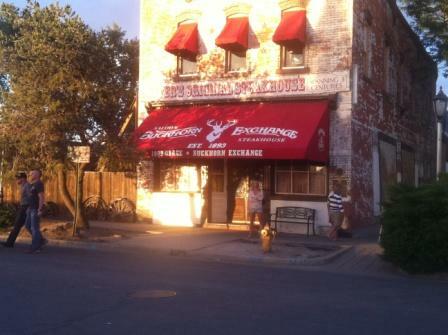 When visiting Denver, The Buckhorn Exchange is a must see and taste. Easy to find, they are located just a few minutes from downtown Denver at 1000 Osage St, Denver, CO 80204. Visit their website: buckhornexchange.com. 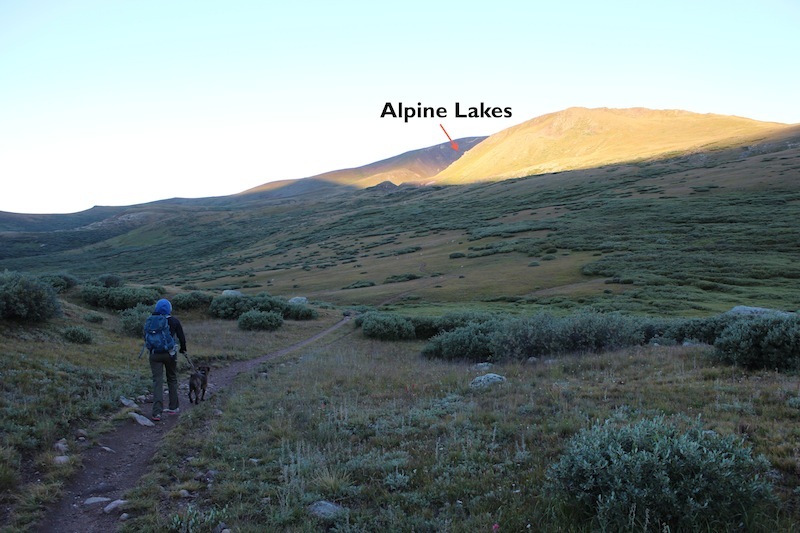 We arrived at St Mary’s Glacier trailhead early and geared up. The school provided everyone with helmets and ice axes, as these were required for the days’ exercises and to traverse the glacier. We checked the temperature when we arrived and it was a chilly 23 degrees and windy. There was a fresh dusting of snow on the road and the trail. As we neared tree line, we could see the wind blowing snow off the glacier and the adjacent peaks. We estimated 30-40 mph winds. Our instructors made the call to stop in the trees and conduct a few classes before heading up to the glacier, as we wouldn’t be able to hear them (they were right). These lectures echoed our homework and the previous class we had on avalanche awareness and snow travel. We learned to read slope angles to predict avalanche prone areas and learned about snow shelters. We also tested the snow by cutting about 3-4 feet down with a snow saw and dissecting the different layers to determine how stable the snow layers were. After the lectures, we geared back up and headed towards the glacier. The wind was furious and we couldn’t tell if it was actually snowing, or just blowing snow. The glacier is located between two peaks, which created a wind tunnel at over 11,000 feet. We zig zagged up the glacier, using the different travel methods we had learned with the ice ax. The instructors guided us over to the side, where we had lunch. Thankfully, the winds started to subside. After a brief lunch, we moved up one of the slopes and dug out a few snow benches, so we could learn the last portion of our class: ice ax self-arrest. We were instructed on how to stop yourself from sliding if you fell on a steep slope. The ice ax is your lifeline!! The weather after lunch couldn’t have been better. The winds slowed, the sun came out and we had temperatures in the 40’s. It was a great day, aside from a little wind burn. We headed to Tommy Knocker Brewery in Idaho Springs after we packed up. What better way to thaw out than with some great brew and food??? Winter took the day off today; and allowed some early Spring weather and sunshine to visit so we could enjoy the Chilly Cheeks 4 mile run at Cherry Creek State Park. The event at Cherry Creek was actually a duathlon consisting of a 10 mile bike ride and 4 mile run; with the option to compete only in the run. We chose to participate in the Run Only event, along with 49 other runners. The cyclists began the race first, with runners being in the last start wave. As most run events are, this was a chip timed race; with the chip being strapped around your ankle. It felt like I had escaped from house arrest, which may have provided me with some motivation to run. 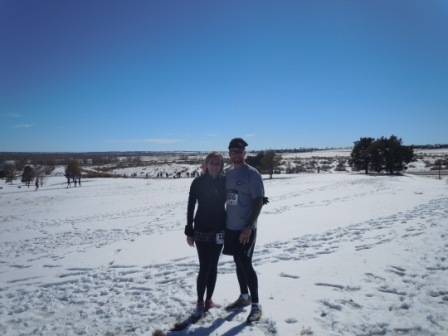 This race was slightly different and more challenging than previous races, with only 1.5 miles being on pavement and the majority on snow-covered and muddy trails; Along with more hills and being about 1 mile longer than our other runs. Around the half way point, I could hear another runner’s steps approaching from behind….And it was a cyclist who had already completed their 10 mile ride and was now passing up most of the runners! And behind him were several other cyclists who were well on their way to the finish line. They were courteous, as they rushed by my slow jog, with “Good Job” and pats on the back. I did stop to walk a couple of times, but accomplished the 4m with a run to the Finish in just under 50 minutes. Our finish line rewards included breakfast snacks, hot ramen noodles and plenty of hydration. 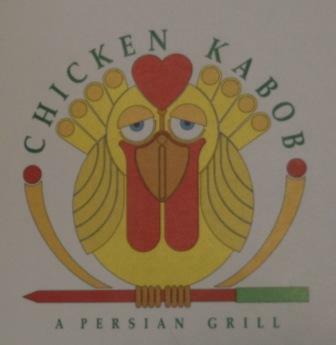 We skipped the noodles, and headed to Chicken Kabob, a Persian restaurant just a few miles away. After recently reading a review of Chicken Kabob in Denver’s 5280 magazine, we decided that we had to give it a try. And it did not disappoint – J tried the Chicken Kabob and I went with the Chicken Koobideh – both with a delicious yogurt sauce and basmati rice. We will definitely be back for another visit. Click Here to read another review (from Denver Westword) about the restaurant and its owner. It’s been over a week since Denver had a record breaking snow storm; but the proof still lingers outside. Almost 18 inches of snow in Denver closed businesses, schools and even interstate highways! But snow couldn’t stop us from taking a weekend roadtrip to the Mountains. We explored Frisco & Breckenridge, tried some Rocky Mountain Oysters, visited a couple of local breweries and enjoyed the beautiful snowy scenery.